The lipstick comes in a pretty red packaging and inside the lipstick bullet placed in a beautiful silver lipstick case. The lipstick packaging looks like a mini red box and it is travel friendly as the lid is tight enough to protect the lipstick bullet. The shades here I am reviewing are REB01 and REB02. The shades are named like this instead of names. The REB01 is a pretty Orange shade with Red undertone. It is a perfect shade for party and evening outings when you like to wear a passionate Red lipstick on your lips. This shade will suits for all Indian skin tones for sure. This shade will brighten up your face as well as your mood. The first point this lipsticks has no annoying chemical smell. The texture of this lipstick is very smooth and creamy, but never bleed. It spreads evenly on the lips and dry lips will like this lipstick more. I feel that this lipsticks are the improved version of colorensational extreme moisture lipstick which are my most favourite lipsticks which has less staying power. But this lipstick has really long staying power. I wore this lipstick for an evening outing and had snacks and tea, when I checked my lipstick on my lips to reapply... to my surprise I saw there is a lovely pink shade on my lips still with the 70% of the same moisture power of it. 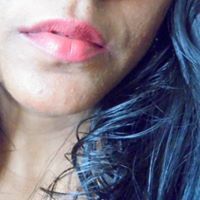 Maybelline New York Rebel Bouquet Lipstick Review and Lip Swatches[/caption]Well, what else a girl needs from a lipstick that is under 500 bucks? I am extremely satisfied with this Maybelline New York Rebel Bouquet Lipsticks and they are really worth to stock up on your lipstick kitty. There are 6 awesome shades to choose, I think I got my perfect pink shade in the form of Maybelline New York Rebel Bouquet Lipstick REB02. 2. They are easily available. 4. The lipsticks stays on lips for long time. 5. The REB01 and REB02 can fulfil a girl's desire on lipsticks. 6. Six awesome shades to choose.